Galician Hebraist; born in Brody Sept. 27, 1820; died at Leipsic Aug. 19, 1880. He was descended from a highly respected family, and was the son-in-law of S. L. Rapoport. For a long time he lived in Leipsic, where he was translator of Hebrew at the courts of law, and was also engaged in business. 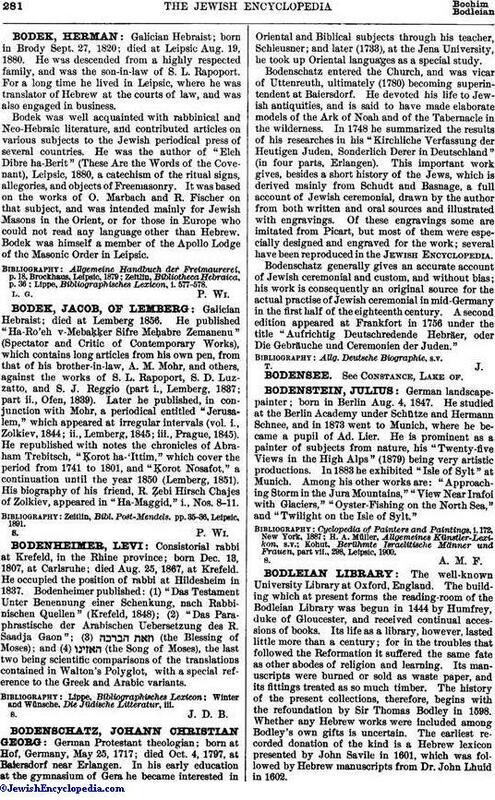 Bodek was well acquainted with rabbinical and Neo-Hebraic literature, and contributed articles on various subjects to the Jewish periodical press of several countries. He was the author of "Eleh Dibre ha-Berit" (These Are the Words of the Covenant), Leipsic, 1880, a catechism of the ritual signs, allegories, and objects of Freemasonry. It was based on the works of O. Marbach and R. Fischer on that subject, and was intended mainly for Jewish Masons in the Orient, or for those in Europe who could not read any language other than Hebrew. Bodek was himself a member of the Apollo Lodge of the Masonic Order in Leipsic. Lippe, Bibliographisches Lexicon, i. 577-578.